As mentioned in my last Post, I’m now playing Elder Scolls Online. 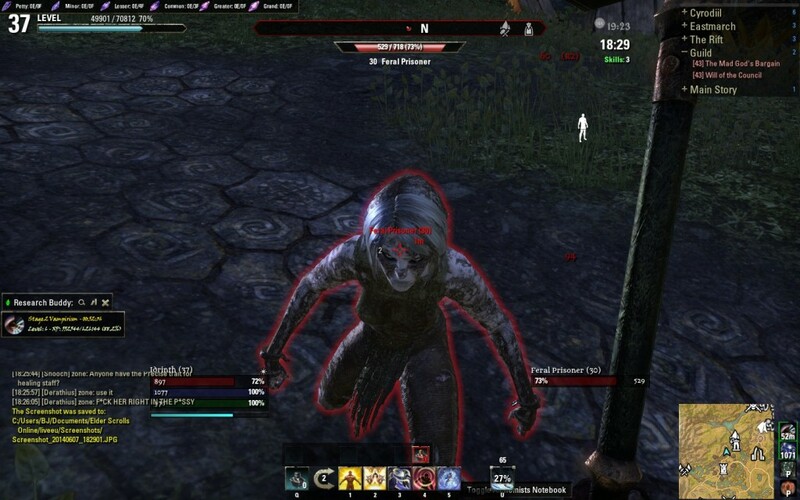 As a high elf and a vampire following the Ebonheart-pact, there’s more than a single place where I should get looks or comments. 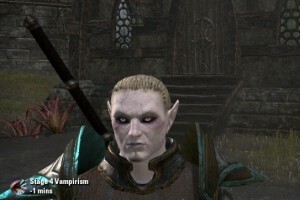 Vampires are certainly not looking elvish and I’m fighting against my own people’s pact after all. What starts getting obvious within the first few minutes already, is that NPCs are blind. The face of a vampire, that’s close to starving (Feeding-State 4) is more than obvious. Wouldn’t any normal creature react – even if it’s running away or warning others about it? To reduce my hunger, I need to sneak to an human-like, living creature without being seen. I can the drink from that creature, while the other option just needs me to target an enemy and use up some mana. Finding something, that actually is human-like and alive is pretty hard. For example the NPC below is either not human-like or not alive and I honestly have no idea how I’d know that from looking at him. The second ability also seems to have trouble with size or danger of the creature targeted. I can’t use it on giants or some champions for example and that is a heavy price to pay in an instance. After all, I could only use it once per fight anyway. It is sometimes hard to guess what creature can still be drunken from and what creature will be immune to it. As a High Elf I suffer about as much from lack of fitting reactions. Some quests make it sound as if I was a Nord, others make me an Argonian, none sees me as what I am. In general I seem to be treated like a member of the speakers race in most cases. I doubt I do that, I lack scales for example. That my people is waging war against the speaker is also never mentioned, even if it would certainly be a big deal to anyone living in such times. That isn’t just sad because of the otherwise good story, that is told, but it also regulary makes me wonder, where the other person is, that is standing right next to me and is being talked to. Of course I know, that the NPC only has me to talk to at that point, but it still is very irritating. Wouldn’t actual reactions and a fitting story make that game more beatiful? But back to the main game. There are quests, that start being are avaible at specific levels. If you do a level 20 Quest at level 25 for example, it does happen, that the NPCs will tell you at the end, that solving something will take a long time, but once you leave the building, you’ll have the messanger for the level 25 Quest avaible. There are a few NPCs, that turn up in multiple quests. If you don’t manage to finish those quests in the expected order, you’ll end up with NPCs ignoring what you already did for them. While understandable due to the complexity of adding dialogue for all options, it happens pretty often, that quests are overlooked and done later, so that the expected “first” meeting is actually the second one. This leads to pretty weird dialogues from time to time. Just before I start complainign: The RvR-Area is nicer than WARs, both larger and more beautiful. The first thing catching anyone’s eye when riding throught Cyrodiil is, that there is a huge amount of settlements, even while there is war everywhere. This is the center of war and only some of those are guarded or damaged. People seem to living a very peaceful life here. I of course know, that those settlements are meant to serve as quest hubs, but their quests, their people and their problems just seem to ignore the war around them – at the very least most do. Who would really care about a letter being delivered to someone else, while soldiers of the enemy are pretty much in viewing range? Screenshots are saved as BMP by default. While not being the most common or even a common format for them, it mostly just wastes space. You can change it in your configuration file at [Drive]:\Users\[Username]\Documents\Elder Scrolls Online\liveeu\UserSettings.txt. Just remember to forbid that file to be changed, because otherwise the game will just reset it to BMP right away. Did you notice other weird stuff? Stuff that rips you from the game and makes you wonder?